Living on a shoestring budget is a serious pain. You, like everybody else, want to live a comfortable and healthy life. But, you also want to afford groceries and pay the bills, right? We’ve been there, living hand-to-mouth, forces you to make very difficult choices. So to make things a little easier we made a list to help you find the best air purifier under 50 bucks. We think clean air is important for everyone. If you live near a factory, farm, or industrial area there is a good chance you’re breathing dirty air. And, opening a window to get a bit of fresh air might make things worse. But, living with the windows closed also exposes you to dirty air. In fact, the EPA says most indoor air is worse that the air outside your home, apartment, or dorm. Editor’s note: Our best air purifier under 50 dollars list was originally posted in April of 2015, and has been revised for accuracy, relevance, and in consideration of new developments in purifier technology. Good for small rooms, up to 110 sq. ft. 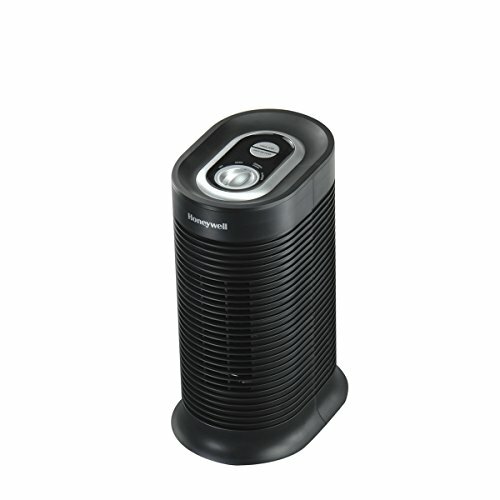 The Hamilton Beach 04383A True Air Allergen-Reducing Air Cleaner is recommended for rooms up to 160 square-feet and comes with a permanent HEPA-grade filter. Because the filter is permanent, you can vacuum it clean and not have to spend money on replacement filters. And at only 13.5 inches tall, it’s perfect for an end table or night stand. Good for small rooms up to 160 sq. ft. 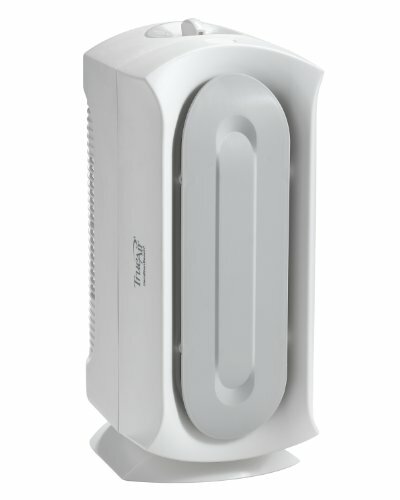 The Honeywell Compact Air Purifier provides you with a permanent HEPA filter. But, it has the smallest room capacity at only 85 square feet. However, it is compact and powerful enough for many applications. Recommended for small rooms up to 85 sq. ft.
Customers complained of this purifier’s noisiness. The three air purifiers we singled out are all under $50. So, they barely make a dent in your checking account. And, they’re all available on Amazon… so no trip to the store is needed. There are some features you’ll give up when your budget is below fifty bucks, but these will definitely get the job done. However, if you can double that figure we actually think you should save up a pick up a GermGuardian. For around a hundred dollars you’ll get a purifier that will keep up with units costing hundreds. Air purifiers are specially designed to clean the air in your home. They’re typically under two feet tall, and they have a powerful fan that forces the air in your home through a series of filters in order to trap particles and absorb odors. There are a few things to look for when buying an air purifier, no matter what your budget. HEPA filters are the standard in hospitals, office buildings, and government offices. Because they’re so commonplace, it’s easy to get an affordable HEPA filter to go in your home’s HVAC system or to go in an inexpensive air purifier. While a True HEPA filter won’t absorb odors or harsh fumes, it can collect tiny allergens and other pollutants as small as 0.3 microns—that’s 99.97% of the stuff in the air. Be careful of imposters, though! If you see an air purifier that has “HEPA-type” or “HEPA-grade” on it, it’s not a True HEPA filter and won’t work as well. A carbon filter, sometimes called “activated charcoal,” is a mineral that soaks up smoke, fumes, chemicals, and smells in the air. If you don’t see “carbon” your air purifier help fight odors. BUYER BEWARE!!! Ozone is a potentially harmful compound that can cause a variety of problems and triggers reactions in those with respiratory health problems. Unfortunately, many companies shove an ozone generator in their products, and give it a gimmicky name like…“energized oxygen”, or even something as ridiculous as “mountain-fresh air.” While everyone should avoid ozone as much as possible, for people with small children, or those with chronic respiratory disorders like asthma or COPD,we highly recommend that you AVOID OZONE AT ALL COSTS! 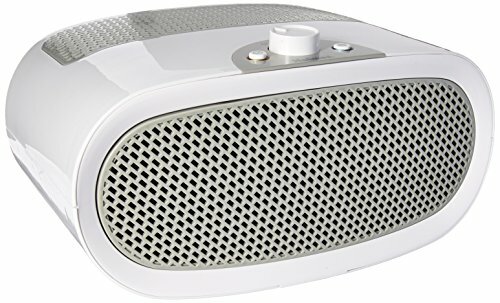 If we had to pick just one as the best air purifier under 50 dollars, it would be the Hamilton Beach 04383A. While it doesn’t have a true HEPA filter, it is the only purifier on this list that comes with a carbon filter to reduce odors and absorb harsh fumes, and it has the largest room-size rating at 160 square-feet.